Before there were computers we let nature be the computer. 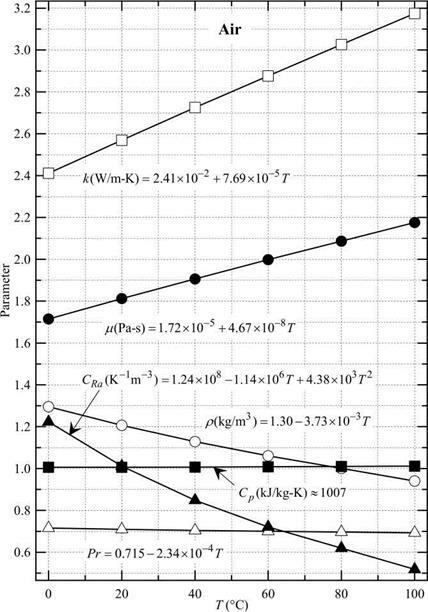 This was performed by using dimensionless numbers and developing correlations between them, particularly when designing complicated flow or heat transfer processes. The essence of the procedure was to take the differ­ential equation applicable to the process at hand and make it dimension­less. The variables were all made dimensionless with process parameters such that they were all of order one in dimensionless form. How this allows nature to be the computer will become evident below. Fig. 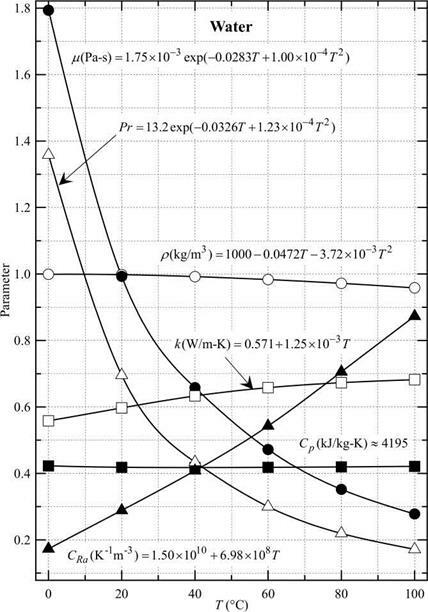 B.1 Various properties of liquid water including: viscosity (д, •), density (p, o), heat capacity (Cp, ■), thermal conductivity (k, □), a group of parameters used in the calculation of the Rayleigh number (Ra = [gxp2Cp/kp]ATL3 = CRaATL3, see the text for the definition of the parameters used to determine CRa, *) and the Prandtl number (Pr, д). The dimensions for each parameter are given in the equation and their magnitude on the graph can be ascertained by putting 0 °C in the equation. All the equations in the graph have the temperature T in °C. Data are from J. R. Welty et al., ‘Fundamentals of momentum, heat and mass transfer,’ Third Edition, John Wiley & Sons (1984). *The prefix Quadrillion is used in the USA energy industry to represent 1015, such as Quadrillion BTUs or Quads. a heat transfer fluid (typically) flows to receive the energy. The pipes have a selective surface and are surrounded by a clear glass concentric tube to minimize heat transfer to the surroundings, similar to the cover used in a flat plate solar energy collector. In order to use solar energy to produce steam and hence power a Rankine cycle to generate electricity, one must concentrate the solar radiation. The concentrated insolation is absorbed by a pipe that has the heat transfer fluid flowing through it. It was demonstrated in the previous chapter that a flat plate solar energy collector can heat water fairly effi­ciently to order 50 °C, however, much higher temperatures, approaching 400 °C, are required for electricity generation. Here the use of parabolic reflectors is considered for electricity production. The Rankine cycle is the cycle of choice to produce electricity and is shown in Fig. 9.1 in a pressure (P)-enthalpy (H) diagram. Water is the usual working fluid in the cycle. Although there are more details to the cycle than shown, such as a reheat component, this will be ignored here so the reader may understand the basics of the cycle and the concept behind its design. It differs from the basic Carnot cycle in important aspects which will be discussed within the text below. Solar thermal energy generated electricity (STEGE) is produced sim­ilarly to a typical, coal-fired power station used today, with the only difference being the heat source. The power cycle for a contemporary power plant occurs by first pulverizing coal into a fine powder which is then ignited to generate heat within a furnace. Water is pumped through pipes within the furnace that are in thermal contact with the inferno and high pressure steam is produced. This is passed through a turbine that turns a generator to produce electricity. The exhaust from the turbine is low pressure steam that moves through a condenser in thermal contact with a heat sink to produce liquid water. The water is then pumped back through the boiler and the cycle is closed.